Click here to read about the Importance of having a Web site and Establishing a Web presence. SO,YOU NEED A WEBSITE? BUILD A WEBSITE THAT WORKS! There is ONLY ONE WAY for most small businesses to succeed, yet, most small businesses DO NOT do it! If you need a website, I encourage you to develop it yourself. After all you are the One who knows your business the best. But do not forget that getting a website is only 10% of the job.Promoting it and getting targeted prospects to visit is the other 90%(do not worry, SBI takes care of everything). There is an amazing set of business tools that will let anyone yes, even you develop a great website with no technical skills. If I could do it, you can do it! SiteBuildIt! is the perfect e-tool for the small-business owner. Typical barriers to any online success - mastering technology, traffic generation, e-marketing and so on,have been almost totally eliminated by Site Build It! 's invisible proprietary technology. I am personally using it and I love it. I am highly recommending it to you too! The Net Offers a wealth of opportunities to service sellers and/or local businesses, but not many of them are using it to its fullest potential. Ken Evoy, M.D. (a fellow Canadian) is a president of SiteSell.com and he is a leader in Net marketing products. Their product, Site Build It! is considered a "quantum leap" product that puts the power of the Net into the average, small business person who may not "know tech"...but knows his or her business. SiteBuildIt! is the perfect tool for service sellers/local businesses, SOHO and any small-small-businesses. No matter if your customers come from around the block (like a holistic practice or any other service), or from across the globe (if you are Programmer). As a local business/service seller you can use Site Build It! to grow locally. Or you can create a new global revenue stream. Or both! Why to use SiteBuildIt! For Your Site? The answer is, because it is an amazingly simple tool that helps you to Automate EVERY single aspect of Writing, Hosting and Promoting Your Web Site. It is a perfect all-tools-one-place solution for everybody who wants to have a website, but have no idea where and how to start, just as myself. If you know how to stack blocks, you can build a SBI! site. Just Point-And-Click. It makes FAST and EASY for you, even if you are a complete newbie, to build a Professional, Popular and Profitable Web BUSINESS. SBI! takes away all the technology and complexity of building and marketing your web site. You do not need to know HTML, the software does everything for you. You do not need a Search Engine Optimization Expert or any other Secret Strategy to learn and you will get High Ranking on the search engines and free traffic from them. Visit SBI! Receintly Store Build It! has ben launched which is the best online store platform in the word. Why? Because StBI! has success built into it! It gives step-by-step instructions, so you never get lost making your online store a reality. For more info visit StBI! And last, but not least, SBI! is far less expensive than the cost of a Yellow Pages ad! It is truly a cost effective web presence solution - that WORKS! Click here to take a quick tour now to see all the benefits. Read third party reviews of sites that were built by SBI!, visit sample sites built by real people or read case studies. The bottom line? SBI! 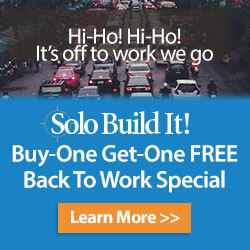 builds sites that WORK for ANY Small Business! You might say: "I love it, but I just don't have the time." No problem! You can find a Certified Webmaster at this Directory, click here, and they will take care of everything for you! 3. Attract a targeted traffic to the site. Watch this short video below, it will explain everything you need to build an online business with Solo Build It!